I decided to spend a week dedicated to making new collages. In addition to the postcard size ones I usually make, I decided I wanted to go bigger too. The collages in this post are the result of my week of cutting out then gluing down little bits of paper. Every bit of every one of these collages was cut from an old magazine or catalog or acquired from a thrift store or junk shop. I didn’t buy any new materials for these pieces of art! How’s that for Reduce, Reuse, and Recycle? 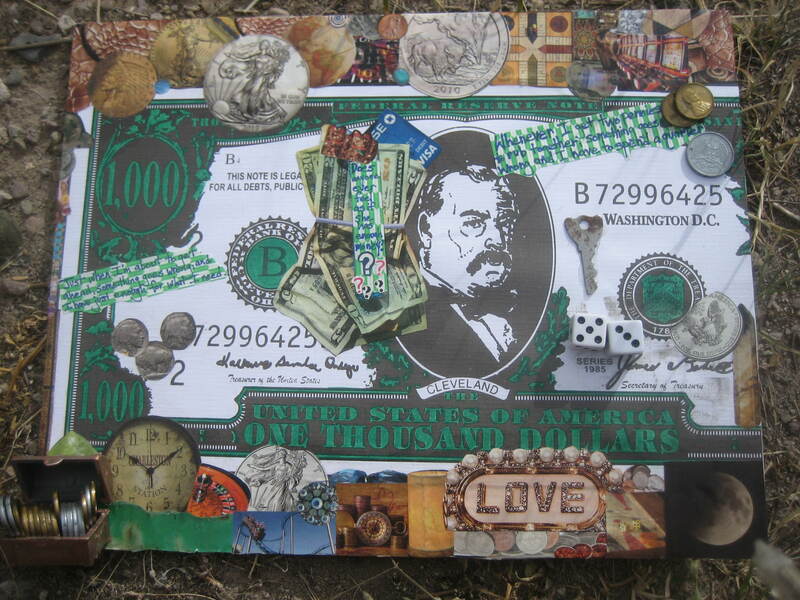 The first one I made was a large (14″ x 11″) mixed media piece about my feelings surrounding money. Called The Root of all Worry, it took me at least six hours to complete. My favorite part of it is the little treasure chest full of coins in the bottom left corner.. This piece is called The Root of All Worry, and it’s big. 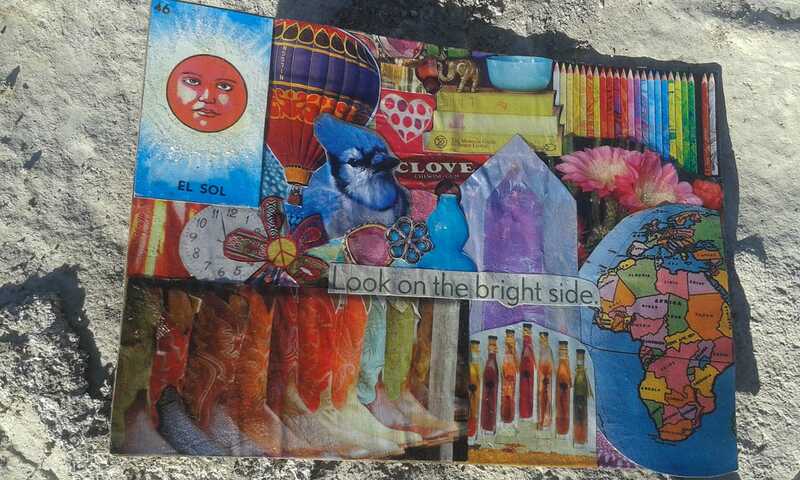 It’s approximately 14″ x 11″ and is one of the biggest collages I’ve ever done. WOW! It costs, $100, including shipping. 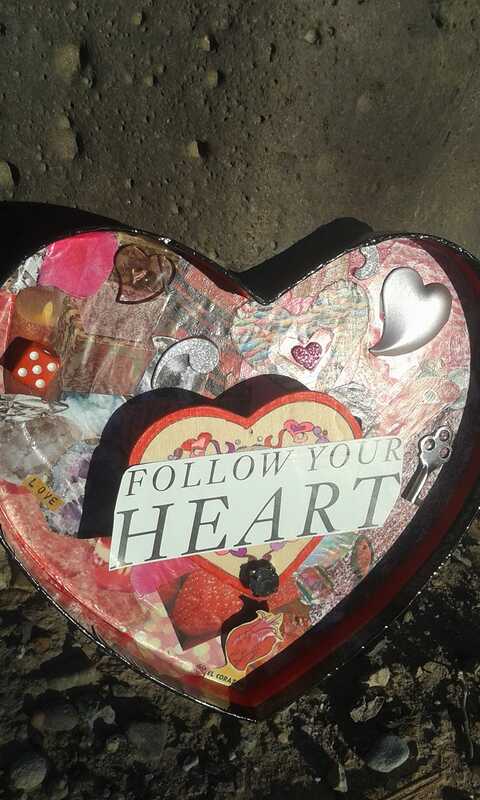 My next collage is called Follow Your Heart. This one is mixed media too. I really enjoyed working with more than paper. This piece is called Follow Your Heart and is approximately 8″ x 7.” It’s made with more than just paper. There’s a key in there and a red die, a metal heart, a plastic heart, and a really big rhinestone. The wooden heart in the middle projects from the base. The piece costs, $35, including shipping. On the day I made Follow Your Heart, I also made Be Kind. I was pretty excited to create two collages in one day. 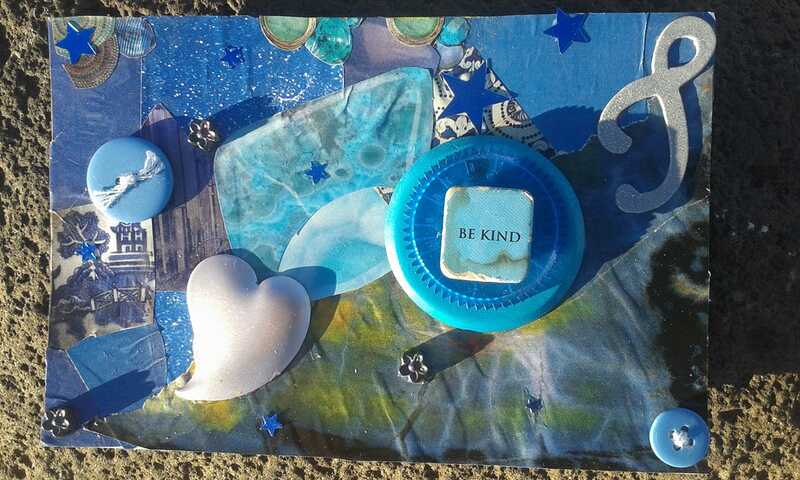 Be Kind is also a mixed media piece. I told you I was really digging mixed media. This collage is called Be Kind. I like that the little card with the words on it is distressed. Sometimes being kind is hard! We should do it anyway! It’s approximately 4″ x 6″ and is for sale for $15, including shipping. 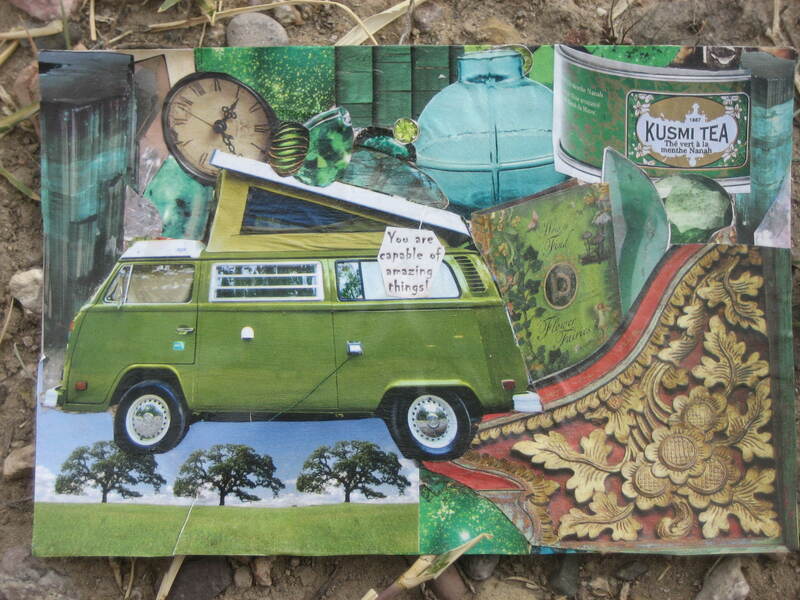 On the third day of my collage week, I had to travel, so I only got one done. It’s called Great Day. This collage is called Great Day. It’s about 4″ x 6″ (actually a smidge bigger) and is made from paper and metal on cardboard. It costs $15, including shipping. On the fourth day of collage week, I worked on a big one. It’s called Who’s the Queen? Who Is the Queen? YOU are the queen! 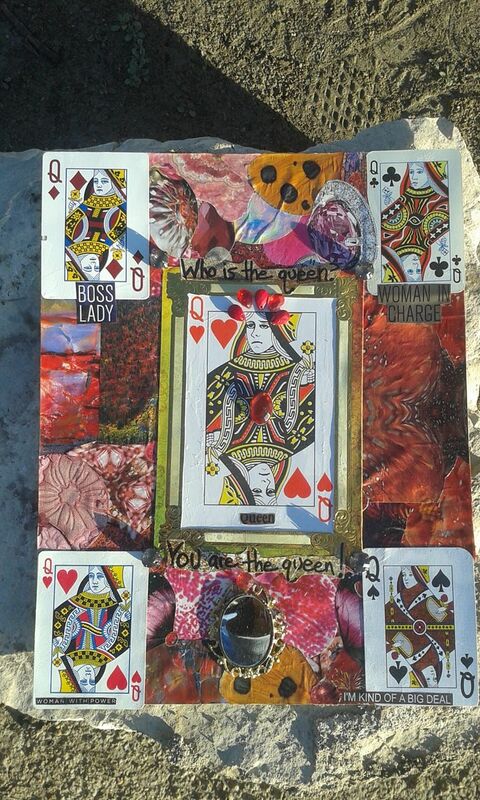 This mixed media piece is approxiamtely 12 and 3/4″ x 9 and 7/8″ and costs $65, including shipping. Just in time for the holidays…a reminder to Look on the Bright Side. What will today bring? Find out by giving the arrow a spin and seeing where it lands. Road trip? Tell it like it is? Misuse of time? Quit your job? Be prepared? Bee Kind…to bugs and plants, the earth and each other. 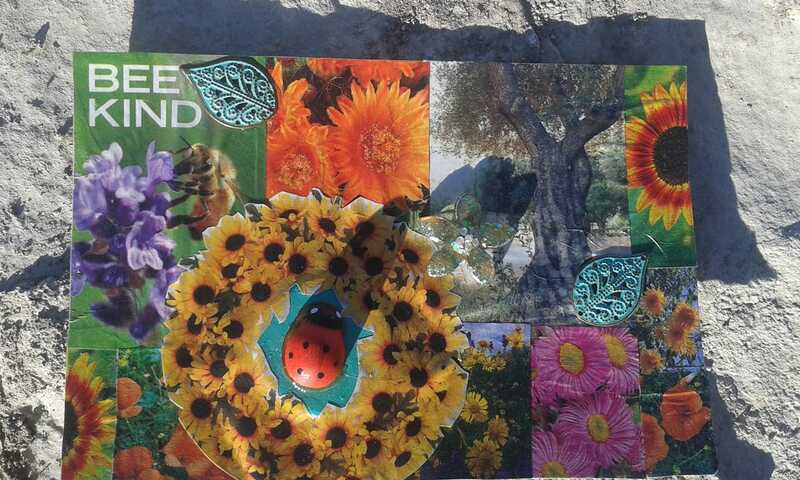 This collage was handmade from a post card saved from the recycling bin, a wooden ladybug from the bottom of the thrift store barrel, metal accents scavenged from old jewelry, and clippings from old magazines and catalogs. It’s a great gift for the nature lover/reuse enthusiast on your holiday shopping list. This piece, called Bee Kind is 4″ x 6″ and is available for $15, including shipping. Go ahead. Start Your Transformation Today. 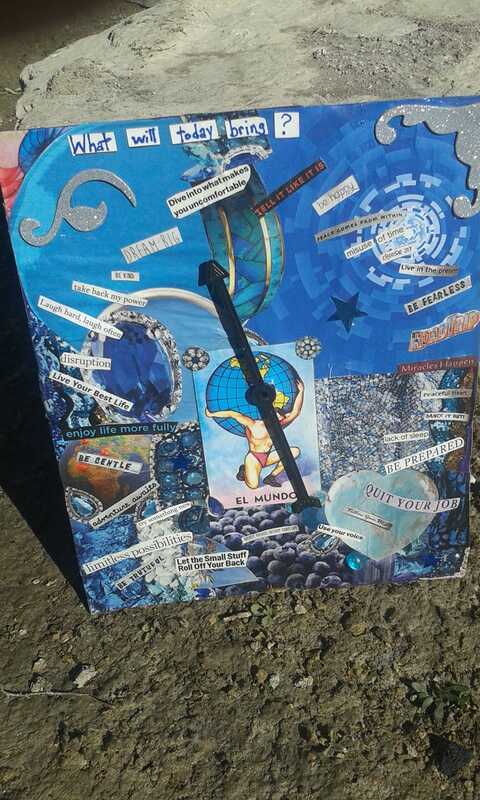 This collage can help by reminding you of your goals every time you look at it. 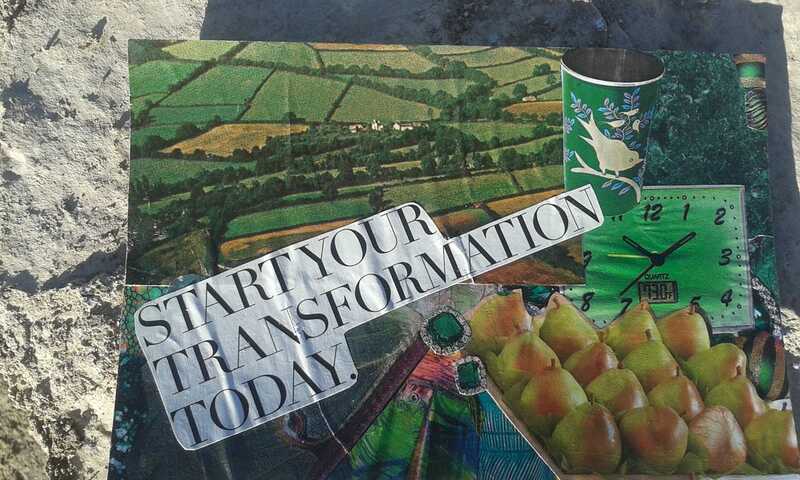 This collage is called Start Your Transformation Today. It was made from a postcard about to go into the recycling bin and clippings from old magazines and catalogs. It’s approximately 4″ x 6″ and costs only $10, including shipping! 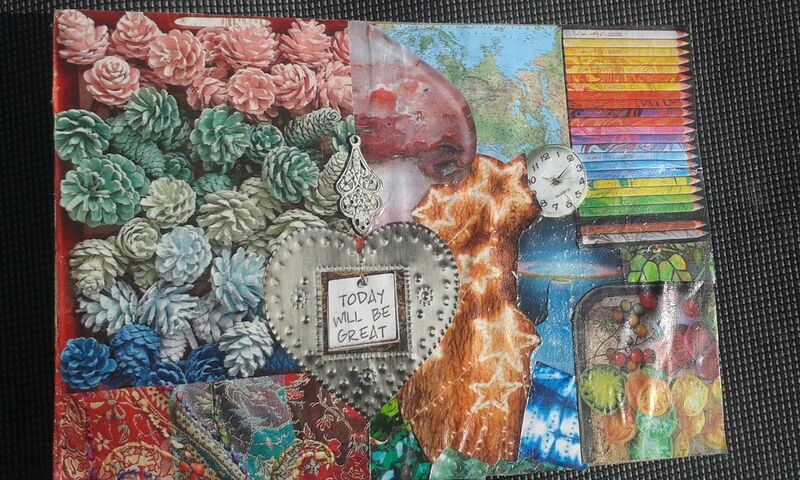 The last collage I made in my on my seventh day of collaging is called You are Capable of Amazing Things. This collage is called You Are Capable of Amazing Things. It is approximately 4″ x 6″ and costs, $15, including shipping.